With a population of 16 million, BYD’s home city of Shenzhen is more than twice the size of London. To keep workers on the move, it uses 16,000 buses. Every one of them is an electric. Peter Ringham talks to the operator which runs them. One of China’s key economic powerhouses and the country’s first ‘special economic zone,’ the city of Shenzhen is vast and continues to expand. Close to the border with Hong Kong – the former British colony is part of China, but run separately – it is officially home to 16m people. In reality the population may be closer to 20m, over 10m of whom use public transport regularly. It is also home to Build Your Dreams – BYD – the world’s largest electric bus manufacturer. Visited by BCB Founding Editor, Stuart Jones, last year, it built 15,000 battery-powered buses in 2017. Starting out as a battery producer in 1995 with just 20 workers, today it has over 220,000 employees and a £15.3bn annual turnover. It also produces battery-driven cars, vans and trucks. 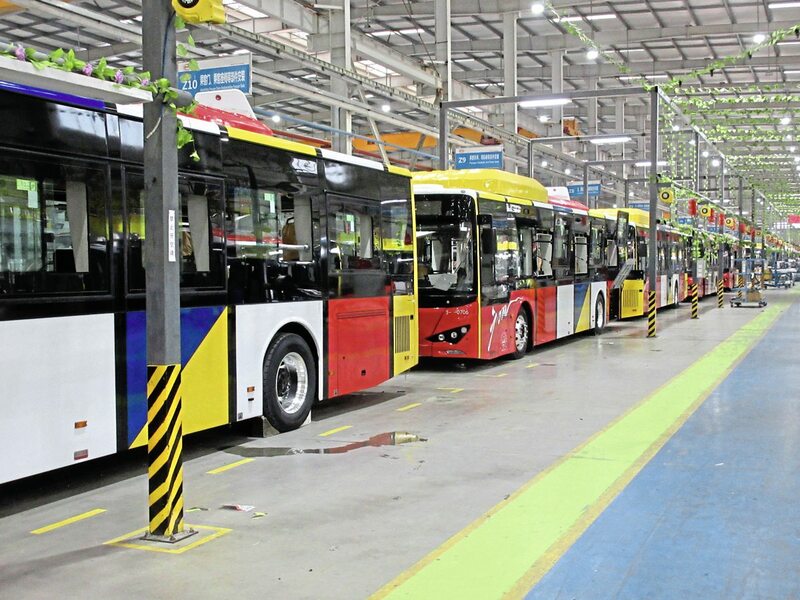 With BYD on its doorstep, and under pressure to cut emissions, it is scarcely surprising that Shenzhen’s entire 16,000-strong urban bus fleet went completely electric last year. It is split between three operators, with Shenzen Bus Group (SBG) the biggest. It operates nearly 5,700 electric city buses – the largest single electric bus fleet in the world – almost 4,400 of which were supplied by BYD. Most of the remainder were sourced from Chinese manufacturer Nanjing Jinlong, with buses supplied by Shenzhen-based Wuzhoulong making up the balance. The SBG fleet roster includes 30 10.2m double-deckers but the bulk of the buses are 10.5m single-deckers. The fleet is supported by 101 DC charging stations with 1,665 charging posts. The average passenger number per bus per day is 237, the average revenue per bus per day is £65.70 and the vehicle-in-service rate is a creditable 99.2%. SBG can trace its roots back to 1975. In 2004, Hong Kong-based Kowloon Motor Bus became its second-largest shareholder with a 35% stake. The remainder of the share capital is held by the state. SBG is the major shareholder in Shenzhen’s Shenzhentong travel card. Travellers can also use an app on their mobile as a payment mechanism. With around 28,000 employees and some £1bn of assets, the 12,000-plus vehicles for which SBG is responsible includes a fleet of taxis: “By the end of the year, all 4,700 of them will be electric,” stated SBG deputy general manager, Joe Ma when B&CB met him at the company’s offices in downtown Shenzhen. Supporting the cab drivers with enough charging points and ensuring they know when they are free will be a challenge, he admitted: “We’re looking at introducing an app which will tell them where there is one that’s vacant,” he observed. SBG typically recharges its buses in less than two hours using fast charging: “We try to do so at night because the electricity is a lot cheaper,” Ma said. “A full charge gives us a 200km range,” he continued. “As a consequence we sometimes have to recharge a bus for half-an-hour during the day if it’s being put on one of our longer routes. “Our energy costs are more than 50% lower than they would be if we still ran diesels,” he observed. An SBG 10.5m single-decker will usually consume £7.97 worth of electricity to travel 100km. Most of the electricity comes from a local nuclear plant although some of the energy comes from solar panels at the charging points. The 10.5m’s closest diesel equivalent will get through £22.77 worth of fuel to cover the same distance. “Maintenance costs are significantly down too,” added Ma. Over eight years a 10.5m single-decker costs almost £5,700 less to service and repair than one of the 11m diesel single-deckers it has supplanted, he said. A fall in the demand for service and repair work means that the fleet’s in-house workshops now have the capacity to look after electric vehicles owned by third parties. That has to be counted as a handy incremental source of revenue. The 10.5m buses are significantly heavier than their 11m diesel counterparts, tipping the scales at 12.8 tonnes as opposed to 11.5 tonnes. 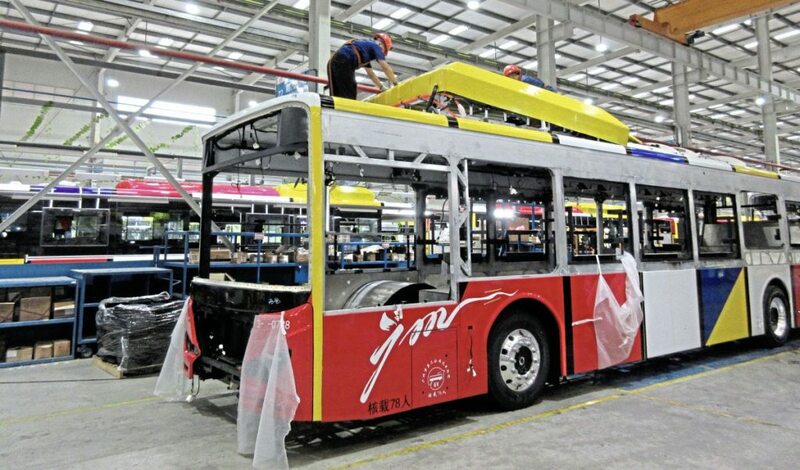 BYD warrants the batteries it installs in the fleet’s buses for eight years, which neatly dovetails with the planned life-span of the vehicles with SBG. They are written down to zero. The warranty responds if a battery falls below 80% of its original charging capacity. There have been some examples of this happening, said Ma. Many of the diesel buses that were replaced with battery models were just three or four years old and still had a lot of work left in them. Not all of them have departed however. SBG still runs 300. It employs diesels on its services between Shenzhen and Hong Kong rather than electrics because there are no recharging points on the Hong Kong side. 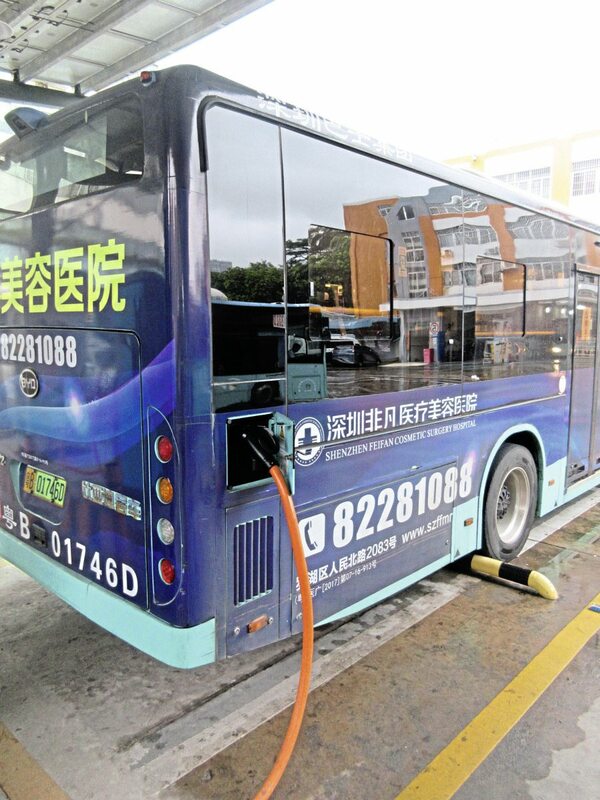 In the past the fleet has operated some buses powered by liquefied natural gas said Ma: “However we didn’t think they offered much of an advantage over diesel,” he stated. The SBG fleet is not wheelchair-accessible, alas. In China there is no law that requires it to be, and two-step access is the order of the day. BYD fits lithium-iron-phosphate (LFP) batteries to all its buses, mainly on the grounds of safety. Other types of battery may offer greater energy density, but safety must take precedence with 80 or 90 passengers on board. BYD is not going to be short of battery production capacity. Next year BYD will open its third battery factory in China, in Qinghai province, which the company predicts will be the largest battery factory in the world. It will cover an area the size of 140 football pitches. Why Qinghai? One of the main reasons is that it is an area of the country rich in lithium says the company. The lithium is locked up in numerous salt lakes in the region, from which it is extracted. In addition to its 770 fixed routes SBG is now promoting a flexible, dynamic service which enables customers to book seats using a smartphone app. It is not based around conventional routes but responds directly to consumer needs, with no fixed stops. “It’s the direction bus transport will move in,” said Ma. SBG is steadily edging towards a greater level of autonomy for its vehicles. “We’ve got four buses on trial in Shenzhen operating at Level 1 on public roads in mixed traffic,” said Ma. According to the Society of Automotive Engineers (SAE), Level 1 describes a situation where the driver stays in control of the bus but can make use of some assistance features. “We’re aiming to go to Level 2, and to Level 3 by the end of the year,” he said. Both involve greater degrees of automation but fall short of complete autonomy. “Scania is one of our partners in developing this technology,” said Ma. How about Level 5, which would mean a bus could run with full autonomy? “The technology is almost there but requires a suitable infrastructure and a lot of the other vehicles on the highway need to be self-driving too,” he observed. He doubts that Level 5 will arrive before 2025: “We need to think about passenger safety so we will always have a driver in the bus, but we may end up calling him a bus ambassador,” Ma said. SBG is eager to promote its impressive safety record. “In 2017 we saw just 0.21 serious injuries per million kilometres, down from 0.37 in the previous year,” he reported. Recruiting and retaining drivers is an ongoing problem, Ma admitted; a situation which will be familiar to many a hard-pressed UK operator. “The salaries we can afford to pay are not high when compared with those earned by other professional drivers and dealing with the travelling public is not always easy,” he remarked. While SBG may run the world’s biggest fleet of electric buses at present, it could soon be facing a challenger. A whopping 6,200 battery-powered BYD single-deckers are going into service with Guangzhou Public Transport. Work on the order started in November 2017 and it should be finished by September 2020. Around 4,000 of them are being assembled at BYD’s site at Shanwei, around two-and-a-half hours’ drive from Shenzhen. The balance are being put together in Guangzhou itself, a provincial capital in the south of the country. Made up of two, linked plants, Shanwei can build up to 3,000 buses annually, and began producing them in May 2016. BYD was encouraged to build the site there by the Chinese government using a mixture of tax breaks and funding for training in order to boost economic activity and create jobs in an area where both were lacking. BYD operates a number of other bus plants worldwide, including locations in Komarom, Hungary and Lancaster, California, USA. Later on this year it will open a factory in France and is well-known in the UK bus industry for its close ties with ADL. BYD provides the battery technology, ADL provides the body. BYD employs 400 people at its European headquarters in Rotterdam in the Netherlands: “We’ve got a research and development team there and we’re now looking for engineers of all descriptions to join it, including hardware and software engineers,” said Ho. 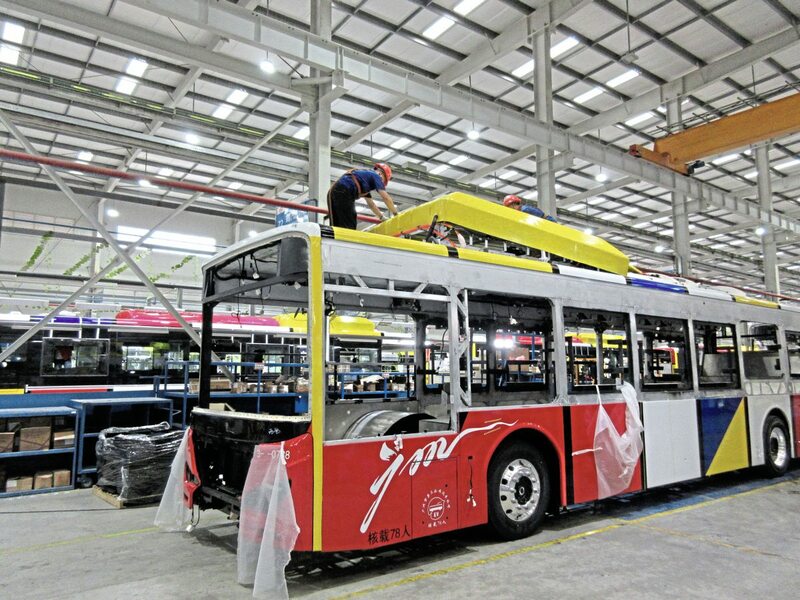 Shanwei handles most of the steps required to build a bus itself, stamping out the aluminium body and roof panels, constructing the chassis, welding everything together, painting the vehicle and doing all the final assembly work. BYD’s headquarters may be the only one in the world with its own monorail. 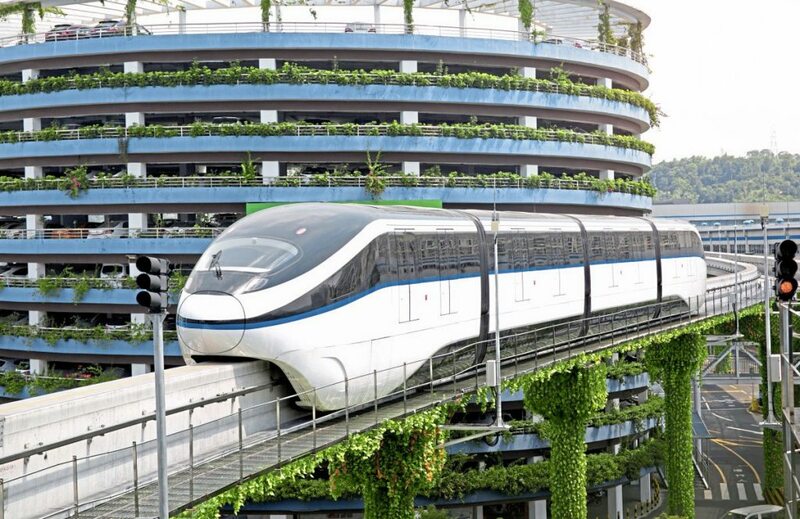 It enables it to demonstrate the SkyRail monorail train it produces on a 1.1km elevated track. Shanwei makes some of the steel structures the monorail requires. 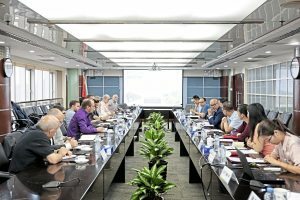 BYD has already supplied SkyRail to the Chinese city of Yinchuan and has signed a £680m agreement to construct a 20km-long monorail system for the city of Salvador in Brazil. It should be finished in 2021 and will be connected to Salvador’s subway. Part of it is built above the sea to link it to an offshore island. BYD’s SkyRail is innovative, able to tackle a 10% gradient, running on batteries and silently on rubber wheels. While a monorail would be difficult if not impossible to install in many of Britain’s older cities, anyone building in wider streets and urban dual carriageway would find its advantages difficult to ignore. It comes in at 20% of the price of a new subway contends BYD; and can be built in a third of the time. BYD is clearly confident that the future is on its side. “Come back to China in five years’ time and you won’t see a diesel bus,” predicted Ho. “Electrification is a done deal as several countries worldwide have announced a deadline for the sale of cars with internal combustion engines to end,” said BYD founder and chairman, Wang Chuanfu. As little as eight years ago people viewed what BYD was up to with disbelief, he added. Looks like they were wrong. “The change is now really apparent, the electric transport era has arrived, and it’s growing faster and faster judging by the demand we are seeing,” he said. Perhaps the biggest challenge now is to ensure that the power electric vehicles use is from a safe, environmentally-friendly and sustainable source. There seems little real point in cleaning up the air in major cities if the source of pollution is simply going to be pushed elsewhere.